It is curious how we took for granted that the years 2010 would not give us any beautiful voices in indie music… The trend being overall apathy when it comes to singing in a mic, the slightest efforts to do otherwise could almost be felt as a clinker. Not to mention that Nanokill, a French electro-pop duo that seems to come straight from some SF uchronia, is wont to add a layer of politically dissenting thinking in their work, and you can really picture those two guys as coming from another era. In truth, it would be a shame to ignore this medicine. Do not bother to try and find similar music, for Eve D’Orso and Axel Noon, even though their music contains more references than what you might think at first, have no clones in the Spotify accounts of our generation Z. Somewhere in-between downtempo, trip hop and synth-wave (the sweet-and-sour “Transitional Object”), the thirteen-song-long album, True Faith, has the good taste of using voices which could almost be described as post-punk, or at least full of lyricism and melancholia that do not need words to be expressed. As for the rest, it is up to you to decipher what it is going on, the lyrics being more potent in their suggestions rather than their external form. It is then possible to be subtle and free from inhibitions in our lowly world. Crazy, isn’t it ? 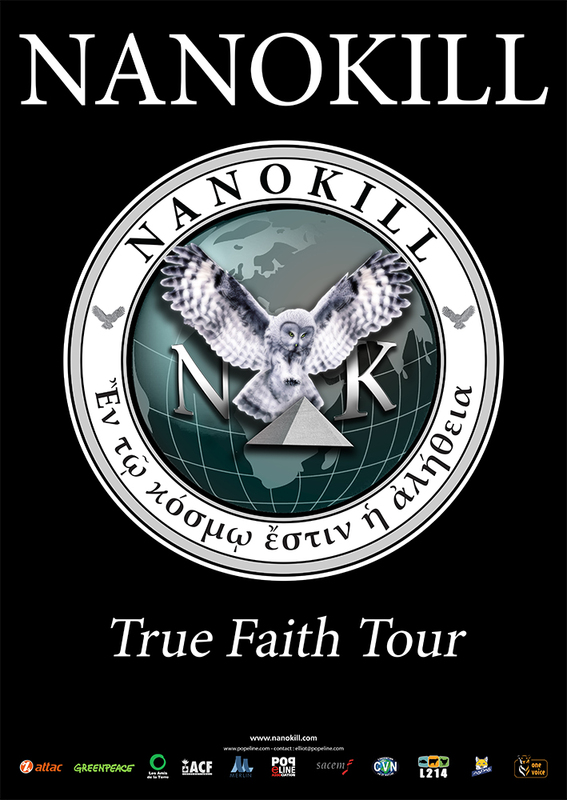 The French/Swiss/Canadian duet Nanokill releases their first album “True Faith”. Their name may not ring a bell, and that’s for a reason : this duet goes off the beaten path and one almost has to look for them to find them. Once the meeting has been set off, the (black) magic works its tricks and the initiatory trip may begin. Their stories are dark, very dark, and one can hear that. Choosing the protection of shadows over the revealing light, the night raptor displayed on the sleeve sports eyes of fire, sentry outpost of an invisible border. Through 13 titles, for more than an hour, Nanokill follows their unique musical path, borrowing their rhythmic base of samples and loops (“Es la Reina y”, “The last one”, “Turn me off”) from Trip hop trended bands such as Massive Attack, Portishead or Sigur Rós, their ever-present drum machines, influences from Kraftwerk’s electro (“Numbers”), blended into a mechanistic music (“Commission Report”, “Laudanum”), or some saturated guitar sounds with powerful and aggressive rhythmic lines (“I Wish You Hell”, “My Dark”, “Transitional Object”) from the Pixies and TV on the Radio’s indie rock (“Wolf like me”, “Will do”). Titles’ length, harmonic variations – “Turn me off” really feels like the jewel of harmonic and melodic perfection that it is – the esoteric mood, nearly oneiric, do bring to mind the masters of Space rock : Pink Floyd. By bringing his own essence – arising from his first garage rock bands (the Ultimate Triangle, the Astroboys) where he shaped his hand – to this happy melting of genres, Axel Noon sharpens the edges, lifts the veil and nails Nanokill’s colours to the mast. With a voice quality diversified and possessed ; sometimes in a mermaid-like, hypnotic and sweet manner, ready to sink the first ship that sails by (“Turn me off”, “Babybox”), sometimes with a benevolent sensuality inside an electro Trip hop ballad (“River of no return” – this album’s first cover, unclassifiable, of the ever-lasting icon Marilyn Monroe) or armed to the teeth with threatening and assertive bass sounds (“I wish you hell”), with rending, though mastered, high-pitched tones (“My Dark”, “Es la Reina y”), all of it showing an undeniable talent and an intrinsic playing strength. Eve d’Orso sets up the deal and largely contributes to Nanokill’s surprising musical identity, indefinable and singular. Built on machines, carried by a cinema-oriented spirit – that we can witness on stage – “True Faith” keeps moving between reality and dystopia, dreadful (and almost foretelling) visions of what our world could turn into. The mystical and most magnificent “True Faith”, the second cover (New Order) – eponymous title of this album – is breath-taking, literally ecstatic. It is no happenstance that this title feels like a glare in the dark of the night, a lifeline near the reef ; it is what remains in the end, a single drop of hope, even if it is bitter. Because magic always looks like it requires a sacrifice, a price to pay that comes along the granted wish ; after listening to “True Faith”, one might forget the daylight outside and legitimately muse on whether one managed to leave unscathed. Not so sure. 18/20 pour cet album qui tourne en boucle ici !